By Randy Donack on 08/29/17 • Leave a comment! If you’re anything thing like me, you might be an amateur photographer who loves to show off their DSLR whenever possible. For that reason, you can’t let people forget that you can totally get better shots than their phone, simply because your camera is tucked away in a bag somewhere. Well with this pillow, stuffed and shaped like a prime lens, you don’t have to worry about your friends and family being oblivious to your expensive hobby. Just set it out on the couch whenever you have company and everyone will know why your Facebook photos of Uncle Joe’s barbecues always get the most likes. In all seriousness, these pillows are handmade and would make a perfect gift for anyone who’s into amateur photography. I know I’d love it as a gift. You can even pick between models of either a Nikon or Canon lens. They’re $45 each, just keep in mind that if you buy one as a gift, you make sure to get the right model. 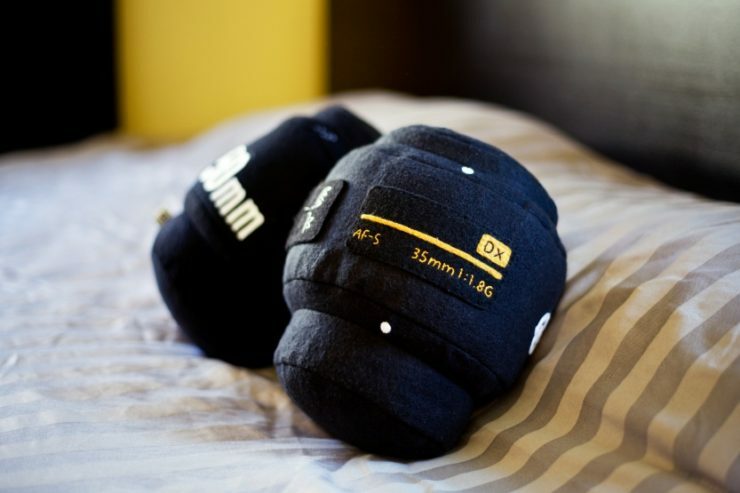 Take it from me, you do not want to buy a Canon lens pillow for a friend who is on Team Nikon, that’s how you lose friends. By Tyler Lacoma on 08/22/16 • Leave a comment! These days we demand that our digital cameras do things that our smartphones can’t – which makes sense, considering how similar some of their features remain. And one thing that digital cameras can do better is survive: Specifically, they can survive in situations and environments where you really wouldn’t want to risk a smartphone – like in the water. So if you love snorkeling, snow sports, poolside antics, or the beauty of underwater shots, we’ve got some of the top waterproof camera picks for you to take a look at. By Andrew Liszewski on 09/21/11 • Leave a comment! For better or for worse, last night Nikon introduced their long rumored Nikon 1 system, officially throwing their hat into the brave new world of compact digital cameras with bigger sensors and interchangeable lenses. Interestingly enough, of all the camera manufacturers to enter this market, Nikon and Canon have long been the holdouts. So while the world still strokes their beards, pondering what Canon has in store, let’s take a look at what Nikon’s brought to the party. 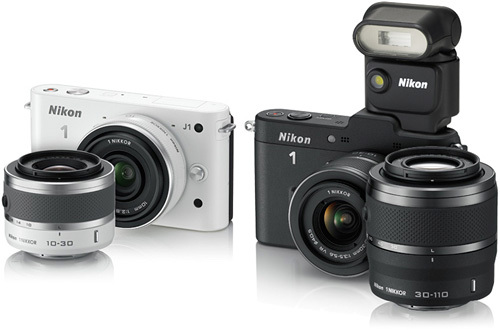 The cameras in the Nikon 1 line currently come in two flavors. The lower-end, $649.95 (including a kit lens) Nikon 1 J1 and the higher-end, $899.95 Nikon 1 V1 which is probably what most photography enthusiasts will be after. 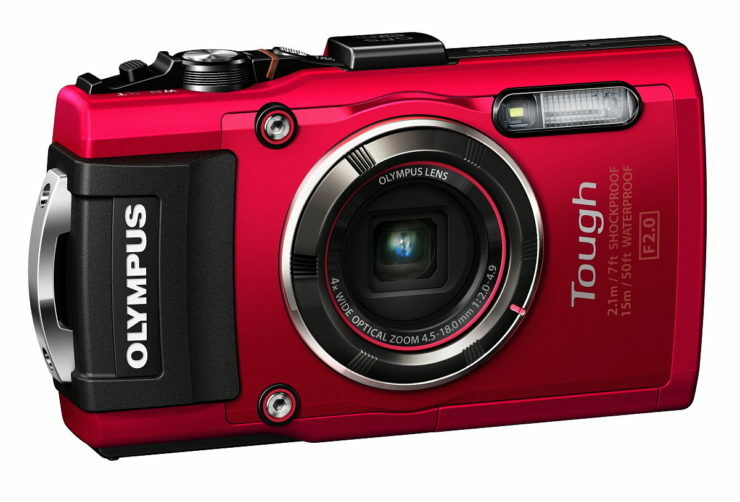 Both cameras include a 10.1 MP CX format sensor, which is larger than the one found in your average compact P&S. But, still smaller than a Micro Four Thirds sensor which is more common in these types of cameras. Both cameras pack a dual core EXPEED 3 image processor which lets them do nifty tricks like shooting video at 1080P while capturing stills at the same time. In fact, Nikon uses it for their ‘Motion Snapshot’ feature which combines slow motion video intercut with stills, and a cheesy soundtrack. Slightly more useful are the cameras’ ability to fire off a bunch of shots in rapid succession, saving only the best of the best based on sharpness and contrast. Nikon even claims their 1 system has the world’s fastest autofocus, with a hybrid system using both phase detection AF for speed and moving subjects, and contrast-detect AF for low-light situations. As for the price difference between the two models? As you can see in the product shot above, the V1 adds a 1,440,000 dot SVGA electronic viewfinder and an i-TTL hot shoe allowing you to use Nikon’s new—and adorable—1 SB-N5 Speedlight flash. Admittedly, neither model is really going to shake up the compact, interchangeable lens camera market. At least not as much as Sony’s NEX cameras did with their big APS-C format sensors. But as someone who’s been a Nikon DSLR user for years now, and who’s never been a fan of their smaller P&S cameras, it’s nice to have a more compact option when I feel like lightening my photography load. By Andrew Liszewski on 04/19/11 • Leave a comment! Whenever someone with a new DSLR asks what’s the first lens they should buy to complement their kit lens, the answer is usually a 50mm prime- ƒ1.4 if you’ve got the money, and ƒ1.8 if you don’t. They’re sharp, fast and as a result produce some fantastic shallow depth of field shots. However, if you’re the owner of one of Nikon’s entry-level DSLRs, like say the D40, the company’s standard 50mm prime will work just fine, except for the autofocus. The lens lacks its own AF motor, and to keep their entry-level cameras at entry-level prices, they’re also lacking the necessary hardware to take over AF duties. So you always have to focus manually. For years now Nikon users have been hoping for a newer version of the company’s 50mm lens, and last week it looks like their dreams have almost come true. 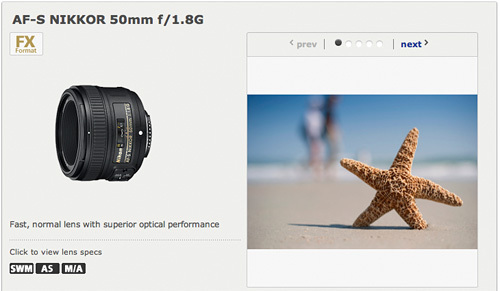 Nikon had posted a page showcasing a new AF-S 50mm ƒ1.8G lens that has since been taken down. But Nikon Rumors managed to save a screenshot detailing the lens in all its glory. It’s listed as an FX format lens but will work on both FX and DX bodies making it compatible with every DSLR in Nikon’s lineup. As for pricing, we’ll know that once Nikon decides to make this all officially official, but optimistically we’d like to see if fall somewhere in the $150 price range. Continuing the tradition of innovative technology that began with the revolutionary D90, the first D-SLR to capture HD movie, the D7000 features a new 16.2-megapixel CMOS sensor with low-light ability never before seen in a DX-format (APS-C) camera. The new EXPEED 2 TM image-processing engine fuels the enhanced performance of the D7000 along with a new 39-point AF system and groundbreaking new 2,016 pixel RGB 3D Matrix Metering System to deliver amazing image quality in a variety of shooting conditions. Additionally, the D7000 D-SLR provides full 1080p HD movie capability with full-time auto focus (AF), enabling users to capture their world with both striking still and moving images. Like I said my only complaint with my D70 these days is its low-light performance and noise even when boosting the ISO to just 400. But the D7000 boasts a native ISO range of 100-6400 which can be expanded to a “Hi-2” setting of 25,600. The D90 was quite a champion when it came to low-light photography, and I expect even better results from the D7000. And even though I’m still pretty apathetic towards it at this point, the D7000 also improves on the D90’s video recording capabilities with the ability to capture 20-minute 1080P/24fps clips with full-time autofocus (including face priority and other AF functions) and manual exposure control. If for some reason you prefer the video-like look of 30fps you’ll have to drop down to 720P. Clips are captured as H.264 files which can actually be edited or trimmed in camera, and since video gobbles up a lot of storage, those looking to pick one of these up for their next low-budget feature will appreciate its dual SD card slots. 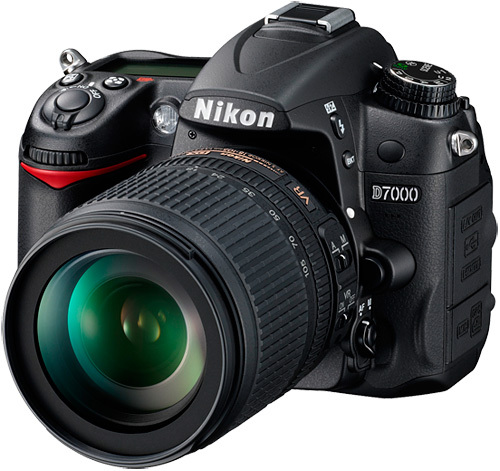 The D7000 will be available sometime in October with a body-only MSRP of $1199.95, or you can pick one in a kit that includes an AF-S DX Zoom-NIKKOR 18-105mm f/3.5-5.6G ED VR lens for $1499.95.